If you already have a case for your phone that you don't mind using or you have purchased a spare case that you wish to adapt for use with the C-3 or C-4 adapters, all you need is the C-2 disc which is available with either a sticky-backed Velcro™ fastening or plain for you to can use a durable adhesive*. Initial findings with the Velcro™ / Hook+Loop option have been very favourable. *Note: We, The Birders Store / PhoneSkope cannot accept any liability nor take responsibility for any matters relating to the use of solvents or adhesives. The use of durable adhesives is just a suggestion. Both sides of the Velcro™ have a hole pre-cut in the middle, one side you align with the hole in the C-2 disc and the other you align with the camera's lens opening in the case. If you wish to trim any Velcro™ that overlaps the sides or end of the case, you can do this either before or after attaching it. Doing it before is easier by marking the white protective paper over the adhesive on the back of the Velcro™ ready for cutting. 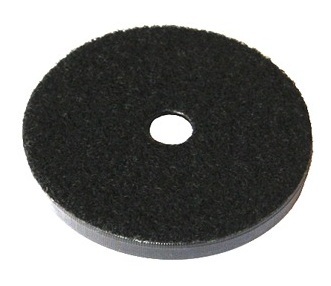 Once you have done this, simply Velcro™ the C-2 disc to the case, aligning the two holes as exactly as possible. You can then add your choice of C-3 or C-4 adapter and will be ready to go.